The Fed's banking survey seems to indicate that senior bankers on the whole see slower demand for auto loans in the US - see chart. The real issue here however is less with auto borrowers' demand and more about increasing competition. Even the largest lender in the space, the TARP-funded Ally Financial (formerly GMAC) is facing competitive headwinds as it loses its cozy relationship with Chrysler (while its GM contract is about to expire). And more banks are jumping into auto financing recently - particularly now that the mortgage refi gravy train has ended. WSJ: - An exclusive contract with Chrysler to provide so-called subvented, or promotional rate loans, to car buyers ended last April after the auto maker struck a new financing partnership with lender Santander Consumer USA Holdings Inc.
A similar agreement with GM was set to expire at the end of 2013, but Ally President William Muir said during the call Thursday that the companies have extended their existing agreement and are working on completing a new agreement. Competition in the auto-lending business has intensified during the last two years as more banks have increased their focus on the business amid a rise in loan demand. Competition is especially heating up in the sub-prime auto lending - with companies such as Santander expanding into the business. Reuters: - Santander Consumer offers loans through 14,000 car dealers across the United States and has about $25.6 billion of loans outstanding. A majority of the company's loans are subprime, which have higher yields but also higher default rates. The demand for yield combined with ample liquidity has created a bid from shadow banking in the form of sub-prime auto ABS (asset-backed securities). 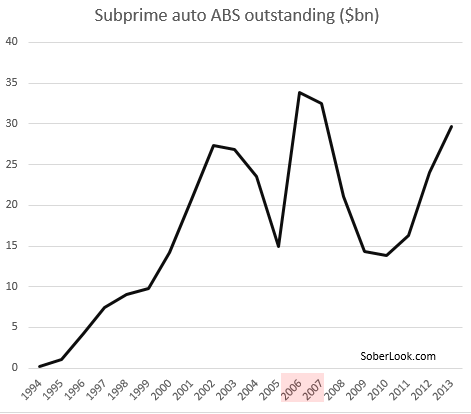 The sub-prime ABS outstanding has increased significantly since the end of the recession. Of course all this competition means lower rates, riskier loans, and higher delinquencies. Automotive News: - Subprime financing -- and delinquencies -- are likely to grow in 2014, says Melinda Zabritski, senior director of automotive credit for Experian Automotive. With more aggressive lenders in the market, many bankers are indeed experiencing less demand - particularly if they want to maintain their margins. The question is - at what point does this market become overheated?